Bill Nelson is a Democratic member of the United States Senate, representing Florida. The Haitian Memorial Pyramid Project was conceived in Jacksonville, Florida by Communist Party USA member Russell Pelle several months after the January 12, 2010 earthquake. In March 2010, it was presented to and supported by Florida State Senator and Communist Party USA sympathizer Anthony Hill at a Haitian-American beach party. An Executive Board was established and project incorporated November 10, 2010. The first formal endorsement came from Senator Hill Nov. 24, 2010. In 2011, the project was endorsed by Jacksonville Fl, Mayor Alvin Brown, U.S. Congresswoman Corrine Brown, and U.S. 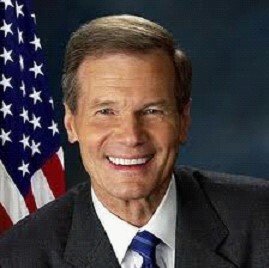 Senator Bill Nelson. Alliance for Retired Americans endorsed Bill Nelson in 2012. The following Senators currently belong or belonged to the Senate New Democrat Coalition. This page was last modified on 23 January 2019, at 04:07.